Mohamed Soltan, 26, is a civilian journalist and an activist. His passion, which saw him covering the pro-Morsi Rabaa Al-Adaweya protests and the subsequent bloodshed on August 14th 2013, has been used against him. Arrested on August 25th 2013 in a raid that was intended to arrest his father and Muslim Brotherhood official Salah Soltan, Mohamed’s family says he has been accused of spreading false news regarding the “operation of Rabaa” case. To protest his innocence, Mohamed Soltan has been on a hunger strike since January 26 2014 – a hunger strike that is now seeing his life in extreme danger. 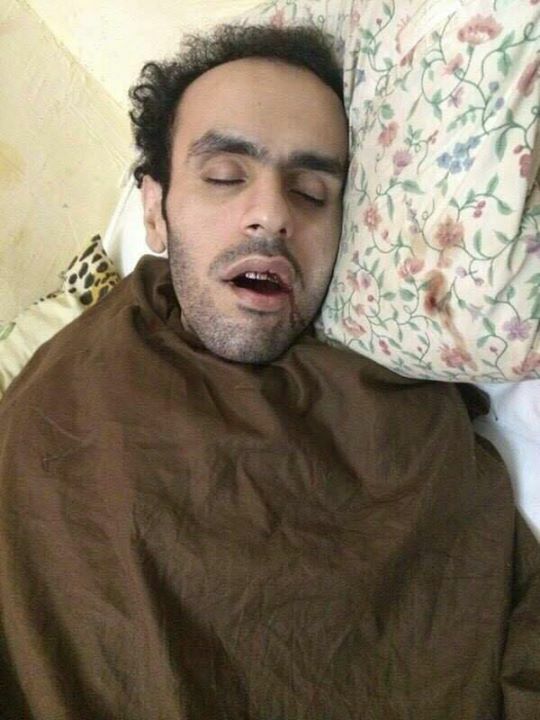 In statements to Egyptian Streets, Omar Soltan, Mohamed’s brother, said Mohamed has been “tortured physically and mentally, refused medical care to [a gunshot wound he received] while covering the [Rabaa Al-Adaweya] protests” and has been refused release on health grounds despite pleas from US President Obama and other US officials. Omar Soltan added that Mohamed has had multiple strokes due to a preexisting medical conditions and has on numerous occasions fallen into a coma. In the latest statement released by the family, a photograph showed Mohamed Soltan in a dire condition, with dry blood on the pillow next to him and blood in his mouth. “We are petrified with the thought of what condition Mohamed is currently in and we continue to call on all human rights organizations and the U.S. Government to do whatever it takes to secure his immediate release,” said the statement. Latest photograph released of Soltan. “The family has been pleading with Mohamed to break his strike due to his dire condition, the increased torture tactics being used against him, and the suicide attempt narrative being pushed by the authorities. Mohamed has been refusing to break it. However, he has recently agreed to begin taking in a sufficient amount of liquids,” continued the statement released by the family. Mohamed Soltan is one of 52 defendants on trial charged with spreading false information in order to support the Muslim Brotherhood, according to the prosecutor general. The health condition of Mohamed Soltan has come to light just days after President Sisi promised to pardon those wrongly arrested, or those arrested without evidence, on the anniversary of Egypt’s January 25th revolution. Should Egypt’s President Al-Sisi pardon Mohamed Soltan on health grounds?